Exercises, procedures, tips and ideas to have fun and improve your photography. 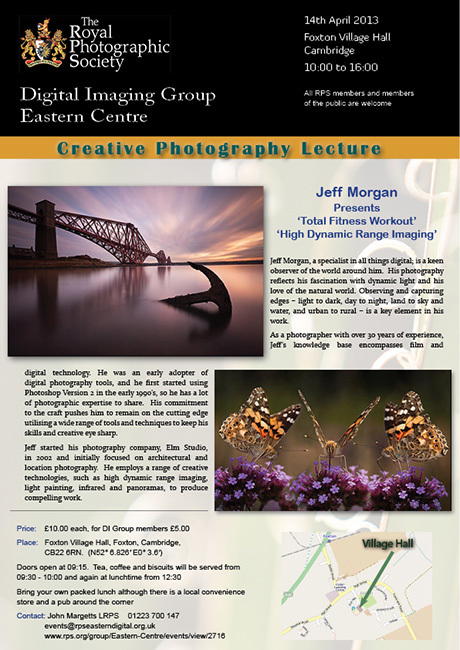 Jeff will look at some exercises you can practice that will expand your creativity and strengthen your repertoire of skills. Learn some techniques and procedures that will enable you to quickly improve your pictures and communicate with more visual impact. This presentation will cover two sets of exercises: the first one is designed to help you increase your compositional and aesthetic skills, and the second one will cover the technical controls you should incorporate into your artistic vision. If you have ever photographed a high contrast scene, you know that selecting the correct exposure means compromising either the bright highlights or the dark shadows without being able to capture either end of the scale for maximum visual effect. High dynamic range imaging is a set of techniques that allow a far greater dynamic range of exposure than normal digital imaging techniques. An HDR image offers the advantage of much greater dynamic range, making it possible to capture both the brightest and darkest parts of an image without sacrificing one for the other.